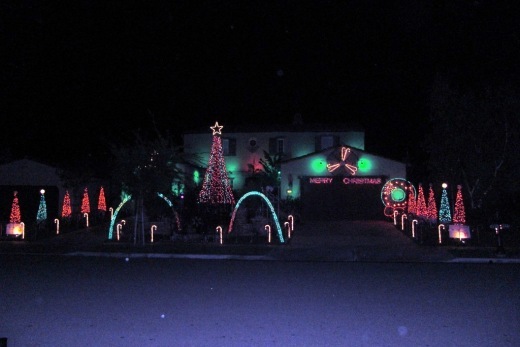 Brian Fuchs will be bringing back his fantastic 50,000+ light synchronized light display for a 4th year at his residence on Via Patricia in the Dos Vientos section of Newbury Park. The show will take place most nights from 5pm to 10pm, beginning I believe the first weekend of December. 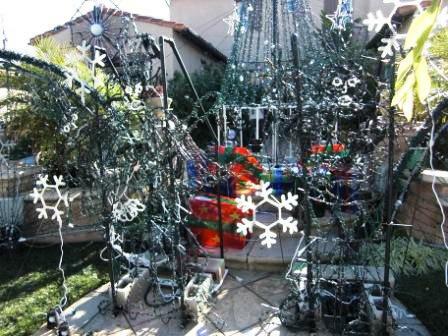 Fuchs hand crafts the entire amazing display himself, welding together trees, wreaths and other decorations. It takes him over 400 hours to put this display together! There are no "physically" moving parts to this display...but there are moving, flashing, blinking light displays that will mesmerize you. The display is synchronized with fun holiday music played on FM 99.1 (listen in car or bring a small radio). Display will be closed on rainy nights. Please be mindful of the neighbors. Below are some photos from the display last year. Here's what it looks like during daylight hours...quite complex looking!